Dog Joint Pain: Avoid These Foods! 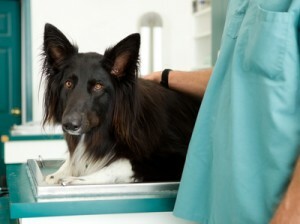 Dog joint pain comes from many different issues. Without understanding and controlling the problem, your dog could become increasingly immobile, lethargic and unhealthy. Working closely with your veterinarian helps identify the underlying cause of joint pain. Getting a proper diagnosis allows you to build a program to reduce the impact of joint pain on a long and healthy life for your dog. Dog breeds with a predisposition to rheumatoid arthritis or osteoarthritis are more likely to develop one of these health conditions resulting in joint pain. Large dog breeds such as German Shepherds may have a genetic predisposition to hip dysplasia that even skips a generation. Some small dogs and toy breeds are genetically inclined to get rheumatoid arthritis. Working with your veterinarian to diagnose and mitigate pain or stiffness from genetic arthritic conditions is a top priority for dogs likely to develop these types of joint problems. Chronic pain is something that isn’t always completely eliminated but can be alleviated. Like humans, dog joint pain might not be arthritic. It is often directly related to being overweight. Obesity is one of the leading factors for joint problems as well as other health problems in dogs. Everything from hip dysplasia and elbow dysplasia are adversely affected by carrying extra pounds. While one or two pounds might not be significant in humans, a small dog that should only weight 10 pounds could be 10 percent overweight with one extra pound. All that weight is added stress to the joints. Exercise and activity are supposed to be good for our canine companions. The problem is some activities can lead to serious joint health issues. Accidents or extended strenuous activities could lead to stress fractures. Long-term wear and tear from vigorous training such as agility training, hunting, hiking rough terrain and other high-stress exercises can lead to degeneration of ligaments and joint tissues. This contributes to conditions such as a luxating patella leading to joint pain. Scurvy isn’t just for pirates; dogs can get scurvy from a Vitamin C deficiency. This is particularly a problem for dogs with or prone to rheumatoid arthritis. Vitamin C helps to synthesize collagen in the joints. A lack of this vitamin means less naturally metabolized collagen that leads to arthritic pain. Vitamin C levels drop when dogs get sick or experience extreme stress like moving to a new home or the loss of a loved one. Septic arthritis is actually caused by a bacterial infection in a dog’s body. With the infection comes inflammation of the joint; joint fluid increases. This is often the result of an injury or trauma that is left untreated allowing an infection to set in. Heat is felt when putting your hand on your dog’s joint if there is a bacterial infection or septic arthritis. Antibiotics should effectively treat health problems like this. If your dog is suddenly not as mobile as he was and seems to be in pain, this could be an indication of cancer. Rheumatoid arthritis is believed to cause at least 8 different types of cancer in dogs. In particular, bone cancer or osteosarcoma can lead to increased pain in the bones and joints and higher incidents of inflammation. When in doubt, see your vet. If your dog is suffering from joint pain, there are many remedies to consider. 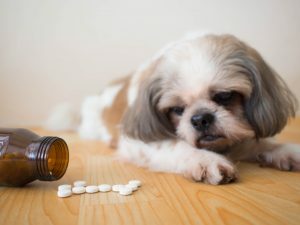 Before you jump into expensive pain medication, supplements or non-steroidal anti-inflammatory drugs (NSAIDS), think about dietary changes to help improve your dog’s health. Simple adjustments in your pet’s diet can reduce symptoms and improve overall joint health. Many dog owners are familiar with many of the food remedies that help alleviate dog joint pain. These include turmeric, vitamin C, yucca and omega-3 fatty acids. Beta-carotene and antioxidants fight inflammation and help improve joint health and overall dog health. Less known are the foods dog owner’s should avoid limiting the effects of dog joint pain. Corn is one of the most common filler ingredients found in commercial dog food. Corn is nothing more than a quick energy source because of its high carbohydrate levels. Thus, it is an empty calorie that can increase appetite for more vitamin-rich foods leading to weight gain. It also increases inflammation in dogs. Inflammation is the primary contributor to joint pain flare-ups. While omega-3 fatty acids are considered good foods for dogs to eat that promote heart health and reduce inflammation, omega-6 fatty acids contribute to dog joint pain and health issues. Foods such as canola, soy and corn oil as well as poultry are in this category. Many omega-6 fatty acids are found in commonly consumed dog foods thus pet owners must be diligent to provide dog food without them. By reducing the amount of grains in your dog’s diet, you can control inflammation. 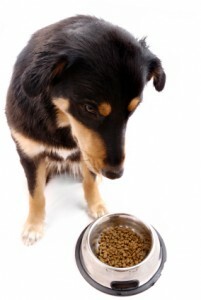 Most dog food bought on the market use grain as a filler ingredient. Many of these grains actually increase inflammation. Read the ingredient list and avoid dog food with wheat, rice, soy or spelt. This not just reduces inflammation but helps with pain directly associated with arthritis. If your dog is suffering joint pain because of gout, he needs a high fat and low protein diet. Eggs, cheese, butter and fruit are the recommended foods instead of buffalo and duck ingredients. Purine is a crystalline substance found in high protein foods and leads to uric acid buildup. The buildup results in lumps and lesions along with frequent urination. As the uric acid buildup is released, symptoms of joint pain lessen. Not all types of fruits and vegetables are safe for dogs to consume. Even among the safe ones, avoid those that increase inflammation. These include nightshade vegetables such as tomatoes, potatoes and eggplants. Potatoes, in particular, are found in many commercial dog food brands. Avoiding nightshade vegetables keeps inflammation in check. You can find many alternatives such as sweet potatoes. There are many things you can do to help alleviate inflammation and joint pain. But in older dogs or canines with kidney or liver issues, you must be careful with some supplements. Make sure you don’t try to diagnose the joint problems yourself. Because there are so many causes and potential health issues, it is best to understand what exactly is going on to then develop the treatment plan that makes sense. There are many supplements on the market such as hyaluronic acid that is said to help rebuild collagen and connective tissue. You can find supplements in food, dog treats or pill form. While most supplements are derived from natural sources and safe for dogs, make sure you trust the supplement source. In general, supplements are not a regulated industry and even less for our canine companions. Read labels and do everything in moderation. If you sense something isn’t right with your dog after taking supplements, go to your veterinarian immediately. Glucosamine is a common supplement used for dog joint problems because it reduces inflammation, helps replace the natural diminishing glucosamine levels in joints and leads to less joint pain. All this helps dogs feel better and seemingly more energetic to get out and do more. 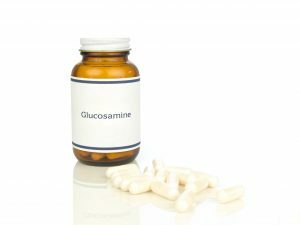 Glucosamine is considered benign at face value because it is something naturally occurring in the body and joints. Older dogs lose natural glucosamine levels which increases the symptoms surrounding joint pain. But glucosamine isn’t without problems. Pet owners should first understand that glucosamine supplements are often made with fish products. Any pet with fish allergies could have an allergic reaction to taking glucosamine supplements. Many treats are made with glucosamine to make it easier to give dogs their joint supplements. However, too many treats not only increase the caloric intake thus the potential weight issues contributing to joint pain, but too much glucosamine can lead to toxicity. In fact, glucosamine overdose is listed as one of the top ten most frequently encountered dog toxins as published by the Pet Poison Helpline. Another thing to consider is dogs with kidney or liver issues, or a propensity to have problems with these organs could burden their system. Metabolizing glucosamine puts added strain on these systems and could result in failure. Signs of joint pain are simple. 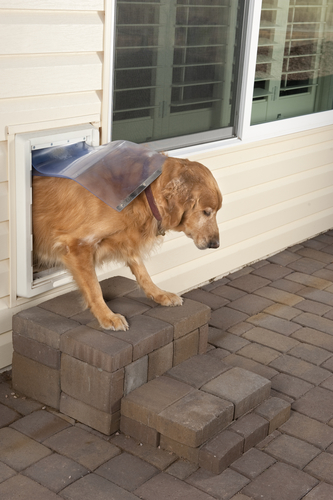 Your dog will limp or stop wanting to do activities he normally would have. He won’t jump on the bed or go for long runs. It might take him longer to get up and down stairs. Whimpering might even occur even when he is simply laying around. Check with your vet for the right treatment combination. Changing his diet and reducing weight often make the most significant differences to alleviating stiffness and arthritis pain. Don’t rule out massage and acupuncture as arthritic treatment options for small and large breed dogs. By understanding why your dog is experiencing pain and finding the right solutions, your best friend will have an improved quality of life and return to enjoying many of the activities he loves. Let us know if you discover other foods that will help reduce dog joint pain!